Tip #1.Add RUN to the Start Menu. This feature gives needed access to many functions in Windows. I use it constantly so why keep it hidden 4 clicks deep in the All Programs menu? Put it back where it was in XP and where it’s easy to access. Here’s how! Right click the Start menu and select Properties/Customize/Scroll down and put a check in the RUN box/OK/OK. That’s it. The next time you want access without hitting the Windows Key + R, it’s right there for you. Tip #2. Add a decent file search. It was the first thing I noticed when moving to Window7. The file search options was cumbersome. How can I point to where it is if I’m looking for it. Here’s a news flash. If I knew where it was, I wouldn’t be searching. What if I don’t want to use filters? How about just finding a file? Heading to the king of all searches, Google, I immediately find what I’m looking for, Everything. “Everything” is just what Windows 7 needs. Simply type in the item to find and BINGO. No more clicking, and shuffling folders. Download it, put it on your desktop, problem solved. It’s quick, lite, and finds….. everything. Anyone with minimum hardware or a system older than two years should be using ready boost. It’s available, easier than ever to set up, and everyone has an extra thumb drive. Why would you not use Ready Boost? Insert your thumb drive and when Auto Play opens click, Speed up My PC/Ready Boost Tab/Dedicate this drive to ready boots/Move slider to desired amount/OK. It doesn’t get much easier than this. If you’re on a new system with plenty of memory then you may not need this but if you’ve noticed your Windows 7 slowing down, give it a try. TIP #4. Add a decent backup program. For the past three years I’ve used the same backup program and recommended it to anyone who asked. The introduction of Windows7 changed that. The paid program I was using no longer worked . I contacted the company and a month later they offered me a free upgrade. I thanked them, downloaded the upgrade and just like my friends had told me, it didn’t work. Oh well, time for a change. 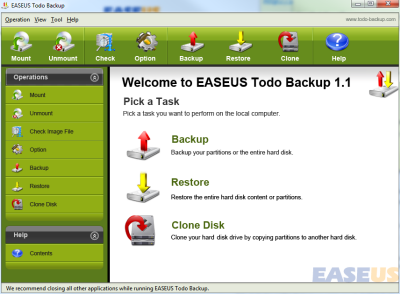 I found EASEUS Todo Backup. It’s extremely easy to use, has a great user interface, and best of all… it’s free! I can do a complete clone of my installation and it’s quite a bit faster than the program I was using. I’m completely happy with this find. TIP #5. Add the top three browsers to your desktop. I know, everyone has their own favorite browser. This one’s faster, this one has more features, blah blah on and on. The fact is that the world of browsers is in a state of massive flux. Browsers are becoming more important everyday and the gaps between them are closing. Browsers are the future Operating Systems. I can’t afford to use only one and not to be familiar with the main players. If you’re using only one, you’re cutting yourself short. It’s amazing what you see when you use more than one browser. It’s also amazing what you don’t see. Of course you won’t know that if your not using them. Download them and keep their Icons on your desktop. They don’t fight….much. These are the things I like to add to my fresh Windows installations. What are yours? The Pit Blog Google, minimum hardware, select properties, speed up my pc, thumb drive. permalink. I would like some one to design a program to alert you that new mail had arrived. That is when you are working in other programs other than web browsing. Good stuff! I’ll be implementing some of that stuff. I’ve been looking for a good backup program. I’ll try that one. Don’t need run command in Win 7 – Type your command into the search bar and hit enter. ie type cmd and you get a command prompt etc. Ready boost only works on systems that run short of ram as a fast usb device is seen as faster than a page file and your system can access both at the safe time without a speed drop in disk access. Meant for older machines capable of running win7 or vista but lacking the ram to do it comfortably. Cluttering up the taskbar with quick start items is far worse than having your favorite apps as a shortcut on your desktop. What do you think a desk-top is for. in the real world you have all the things you really need on your desk easy to see and quick to click. Unless you clutter your desktop with every kind of junk. If you haven’t used an item for weeks then create a temp folder or bin the shortcuts. I use a program called Locate which does a better and faster job than the exisitin windows find even with indexing on. On first use you create a database from then on you just update the database. Windows search even with indexing dosen’t even find files that I know the location of. Locate does and can be customised to find groups of related files unlike the well hidden documentation for the windows version. If I could detach my toolbars like in xp then all would be dandy. Ccleaner, Spybot S&D , perfect disk. I know the new location for DESKTOP is far-right and invisible… but..
Is there any way to re-locate the Desktop Icon similar to XP.?? It can be such a pain to have to mouse over to the far-right when jumping between browser windows and desktop… seems strange to have Desktop far-right and all other working Icons on the left ?? Okay, the “Run” addition I can almost see being an improvement – but not really. I’d say if you cannot find “Run” you should not be playing with it anyway. But the rest of this is pretty silly: most of your suggestions are simply personal preferences that don’t improve anything. Readyboost is kind of neat – but my personal tests showed no improvement in performance at all. If you want to run 7 you need a machine that’s capable, with plenty of ram – no USB gimmick is going to suffice. Icons on the desktop are so 2003. Really, three browsers on the desktop? If it’s not in the taskbar, I don’t need it to be that accessible. Is the start menu so far away? Why not put “Run” on the desktop if you’re such a fan? Windows 7 has a fine built-in backup utility – why not teach people how to use it, rather than push your favorites? It really does seem like you “improvements” for 7 are a bunch of your favorite apps that have little to do with anything. Everything? Why not just enable Indexing? or put an Address box in the taskbar? These are part of the OS and basically do the same thing. How do I get Windows 7 to recognize that GMail is my default mail program? I cannot make it change from launching Outlook every time I click a Mail-to link. I found the setting, but there are no options except Outlook. I’m sorry, I spelled that incorrectly – ePrompter. And it’s not unlimited capability. It will retrieve up to 16 different email accounts. To Mike Phillips re: email notificaiton system. Try ePronpter. Works great. Right now it alerts me to 7 different email addresses and sits in my system tray and has unlimited capability. http://www.eprompter.com. It’s freeware. You really need to add Opera to your browsers list – so far it’s the only browser that i’ve tried that gets 100 on ACID 3. It’s also (according to tests i’ve seen) the fastest browser – today. Ask me again next week, about that. The only reason to have IE on your machine is for the pages designed by lazy SOBs that require some of its misbegotten non-standard “features”. I will not use Chrome until it’s changed to install in the standard manner – to “Program Files” – as it is it installs into your “User” folder. Great tips for even a “non-geek” like me. Thank you thank you…I was going crazy trying to show the desktop. I have asked a dozen people. this was simple,and a nobrainer, even for a no knowledge like me! ReadyBoost doesn’t work with all Thumb drives though 😉 So if you picked up a cheapy at Best Buy its not likely it will work. Click the box to the right of the time… 😉 Click it again to return. Very useful tips. Worth pointing out, though, that Everything will only find file names. It won’t find file content. Your explanation sounds great but not having the new Windows 7 yet but when I do upgrade I will be sure and contact you on here…Amazing how much information you pass on to others….Your great.. In XP it was easy to clear ‘Recent Documents’ and recently used programs so that others did not know what you were working on. In Windows 7 I found in Documents, ‘Recently Changed’, but if you delete these, it deletes the document! Anyone know how to just clear the list? Thanks for the tips. Had not implemented the “run” command fix. ‘show desktop’ can be found on the Taskbar at the extreme right hand side. Hover over the non-descript blank square found there to get a quick view of the ‘desktop, click the square to go there. I immediately applied the first two items. Mike M — The Quick launch bar has been in windows since XP, even most people did not realize it. 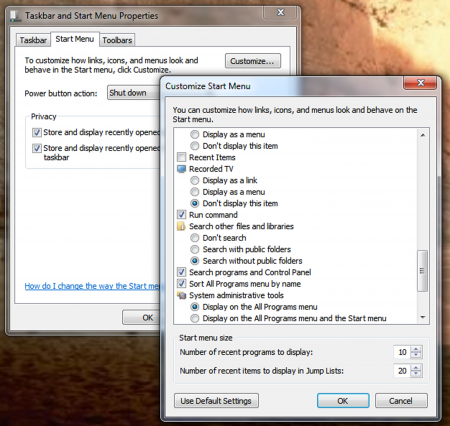 Since this is windows 7, it comes with the search bar in the start menu, but thats not only for search, you can also use it like the “RUN” program. Type in programs you would normally do with run, like msconfig, cmd, regedit, etc, and gets it faster with only 1 click (to click the start menu and then you can start typing; also, can be no clicks at all if you push the windows key, type the program, enter button. ), instead of 2-3 clicks for the RUN program. And then you mentioned to add the 3 browsers shortcuts to the desktop, did you ever think about adding them to the superbar? (taskbar). They can be pinned there, click on it once to run it, or right click on it and then click on the program name to run a new window within in the same superbar icon. I have the ACER mini note book, runs windows 7, and there’s no way to change the main screen (lame) picture for one of my own, I’ve tried it all. Can someone help me pls.!! The 6th way is to remove/uninstall and re-install Vista!! 1. Add the task bar to the top of the screen. This may not seem like a big deal, but look at any application you use. A majority of the menus are at the top. Adding the task bar will limit your need for mouse movement which adds up over the long run. 2. Uncheck “hide extensions for known filetypes”. Seriously who in their right mind wants to hide an extension? 3. Create a temp/app/games folder on the desktop. I like everything basically going to my desktop, and then I’ll manage it from there. If I don’t have a place for it right now I’ll move it to temp and sort it out later. 4. Pin apps folder to taskbar. Basically any app I feel is important goes into this folder. For example notepad, skype, and chrome are in mine. It takes up about the same amount of room as the start button, keeps my desktop clean, and saves me a ton of time. 5. Organize your files. All my music goes on the same drive, all my videos go on a different drive. I have the sorted into subfolders by (genre/artist/album). This elevates the need for me to search for stuff because it’s already categorized. I’ve been running Win 7 for a few months now; there are things I like and things I dislike. I am particularly NOT fond of Micro$oft’s migration towards “libraries”: I am an old school individual and prefer directory stuctures with file placements that I dictate. Oh well. what bloatware should be deleted? Ah yes, bloatware. Custom built PC. No bloatware. Check. Three things I use, and I have been for quite a while. Thanks for the article – just implemented the “run” command fix. Not really Win 7, but Outlook 2007. Pre 2007 when sending/replying etc a message Alt E S, performed a special paste. Now, the darn sequence sends email I’ve had 2007 since it was first introduced and still hit this combination and have to go to my outbox to re-open. Any way to get the old Alt E S sequence back? I use the Built in Backup with my Win7 Ultimate 64 Bit and find that it will do everything that I want and more. why clutter the hard drive with extra software whether it be paid for or Free. I want to save this article until I need it after I buy “7,” sometime in the near(?) future. If I create a shortcut will it find the article 5 months or so from now? The feature I miss most is the facility to show source folders, etc on the screen saver slideshow. With XP each screensaver session became a nostalgic trip, as all the photos are arranged by date/event. Now we wonder..when was that taken! I was not the first to raise this with MS, who had given a previous enquirer the brush off.